Millions of people visit the Disneyland Resort every year and that can leave a big ecological footprint. But it’s an impact that has been reduced by a push to recycle. Those recyclables included paper, bottles, cans, plastic and even used soap from the resort’s more than 2,300 hotel rooms. The soap was collected and given to the “Clean the World” organization, where it is sanitized and then distributed globally to those in need. In terms of water, the ponds and creaks running through the park are connected in a closed loop system, according to the article, and are continuously sent through a filtration system. The same is true for the 16 million gallon lagoon at Disney California Adventure, which takes 36 hours to filter. The water-based rides on park grounds are also on individual closed loop. When they need to be drained for maintenance, the water is sent to the Orange County Water District to be recycled through its groundwater replenishment system. • Rainwater is collected throughout the 12 acres of Cars Land, is filtered and then sent to filtration basins under the rock work, where it is allowed to percolate into the groundwater table. • Toy Story parking areas use porous asphalt to collect rainwater. There are similar plans for Star Wars land. • Sensors monitor the soil in landscaping throughout the resort, measuring moisture and monitoring weather forecasts. The information is used to determine when watering is necessary. If needed, water is distributed via drip tubes, not sprinklers. 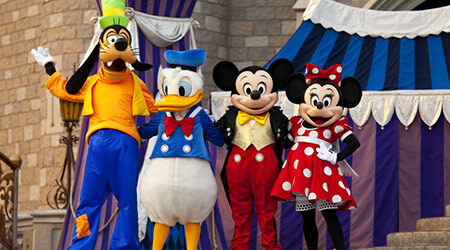 To learn mo re about the sustainable initiatives at Disney, as well as how they use water to save energy, click here.